CHRISTMAS GIVEAWAYS Day 3: Win Spa Credit and Goodies from BloomMe! Click here to see the full list of The Loop HK’s 15 Days of Christmas Giveaways 2018! Treat Yo’self: Who doesn’t love a good spa treatment? Living in the 24/7 hustle and bustle of Hong Kong, it’s important to carve out some me-time for serious pampering. And salon and spa booking app BloomMe is here to help! The Hong Kong-based booking app connects 150,000 users to more than 1,800 spas and salons across the city, and offers up to 30% off the listed price for a variety of treatments and services. Each partner venue has been vetted to ensure quality standards, and 12 categories are available from manicures and facials to medical treatments. You’ll also find honest reviews, pictures and detailed treatment information, so you’ll always know what you’re getting. Ready to kick back and relax? Two of our readers will kick off 2019 is a thoroughly relaxed fashion with a special package from BloomMe! 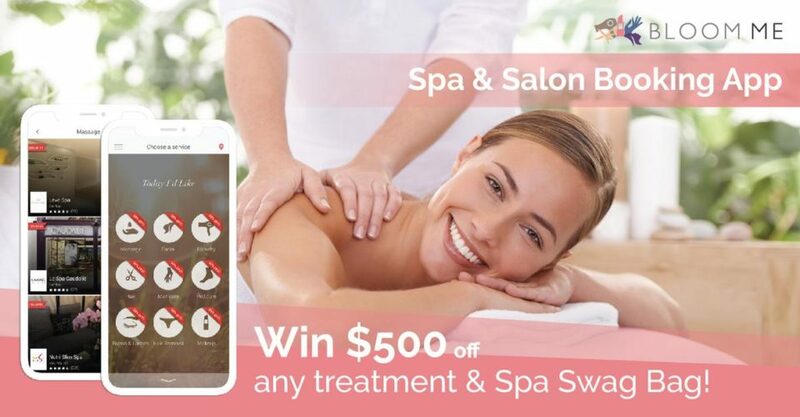 Two winners will receive $500 BloomMe spa credit to spend on treatments booked through the app, as well as a goodie bag filled with spa products. But that’s not all! To spread the Christmas cheer, BloomMe will give everyone who enters this giveaway $100 spa credit to use on the BloomMe app! Enter by December 10. Winners will be announced on December 24. Share this Giveaway with your friends for a greater chance to win! Entry form below. And don’t forget to like The Loop HK on Instagram and Facebook, and BloomMe’s Instagram profile and Facebook page. Written by The Loop HK for BloomMe.